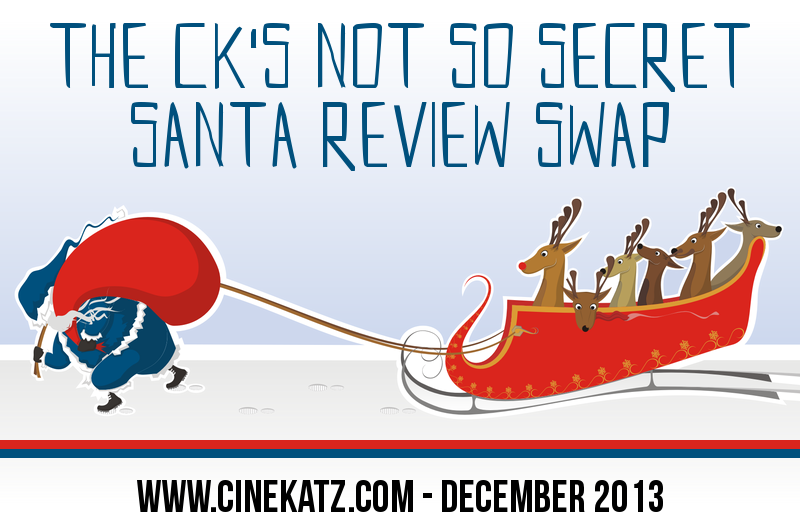 Very pleased to once again be taking part in the Cinematic Katzenjammer Not-So-Secret Santa Review Swap. When I took part in the one in July, I was given quite possibly one of the most pretentious films I've ever seen with Wrong. It seems fitting then that for this one, after the initial film I was given being unavailable in the UK, I've been given the complete opposite, an extremely violent action film with Dredd. Now two things before I start, firstly I will not make an comparisons between this and either the Stallone Judge Dredd film or The Raid, seems pointless doing that, and secondly, I am not familiar with the character of Judge Dredd so I won't be able to say if this film does justice to the character seen in the comics, although hearing from fans of the comics, this film does do justice to the character. All that out of the way, let's dive in. The plot concerns a day in the life of Judge Dredd. He's been asked to do a Judge evaluation for a rookie with psychic powers, Anderson. They choose to go to a triple murder at Peach Trees mega-block and whilst there, they stumble upon the empire of Ma-Ma, the main seller of the drug Slo-Mo, which slows down time perception to a fraction of what it normally is. To prevent Dredd and Anderson from shutting her down, Ma-Ma locks down the building and orders the deaths of Dredd and Anderson so they have to reach the top of the building and stop Ma-Ma in order to get out safely. What I like about this is the simplicity. We don't need any big world-building stuff, aside from the background of the world shown in the first few minutes. The whole focus of the film is to show the insane stuff that can happen in a single day in the life of a Judge and the film does this really well. This also allows time for a lot of character development for Anderson. Whilst Dredd is essentially the same person at the end of the film as he is at the start (the opening action scene letting us know all we need to about the character), Anderson gets a lot of character development. From her background growing up in a block like Peach Trees to her fears over just how insane the situation has gotten, to how she can be freaked out by the villains when she goes into their minds and how she overcomes this by the end of the film. She's a great character and pairing her up with Dredd for the majority of the film is one of the best things the film does. The acting meanwhile aids all of this. Karl Urban as Dredd has a lot of hard work to do seeing as he keeps the helmet on throughout the film and can only act with his chin. However, Urban does a great job. His voice and presence as Dredd let you know that this is someone you don't want to mess around with, he gets a lot of dry, deadpan humour into the character making him a lot of fun to watch. Olivia Thirlby does a great job as Anderson, I've already talked about how well written the character is and this is matched by a great performance by Thirlby. Lena Headey provides a great threat as Ma-Ma, although the character herself was pretty badly written, coming across as really one note, the same going for Wood Harris as Kay. Out of all the villains, the best one was Domhnall Gleeson as the Techie. Gleeson gives a great performance and we see a sense of fear that Ma-Ma will kill him if he doesn't do everything exactly right, along with a sense of intense pain over everything that's happened to him before the events of the film. I really hope that more people become aware of Gleeson as a result of this film and About Time and go and watch some of the other stuff he's done, mainly Black Mirror: Be Right Back. The technical aspects of the film are excellent as well. The action scenes are incredibly well directed, everything is really clear to watch, the gunfights are really well directed with the fight scenes focusing on Dredd later on in the film being some really intense action scenes. The film also makes incredible use of slow-motion. Whenever a character is on Slo-Mo in the film, the film slows down to create some really beautiful moments and the action scene making use of this is an incredible set piece. We see the ripples of the bullets going into the people and the formation of the blood splatter, these scenes are incredibly well done. The design of the film is also great. There's this really dingy, run-down sensibility to Peach Trees, letting you know that people just don't really care about the upkeep of the building, really fitting into the dystopian city mindset that the whole film is going for with Mega City One. Overall, Dredd is a great action film. The action scenes are incredibly well directed, the performances by Karl Urban and Olivia Thirlby are excellent, along with the character development for Anderson and the plot makes great use of these characters. The only real complaint I have is how the villains feel underdeveloped but with the rest of the film being this good, this is something I can overlook. Good review Tony. The movie definitely had all of the style and grittiness to it that definitely separated itself from the cheesy Sly Stallone-vehicle, however, it felt just way too much like the Raid. So much so, that I feel like there was plenty of more action there, then here, which is rather strange. Nice work. I think this film is entertaining as heck and maybe a little violent. Nice review! I'm glad you didn't take the lazy route of comparing it to the first Dredd flick (which is all of wretched save for Mean Machine) OR The Raid (which I don't think it's copying at all, as that idea isn't exactly new), so thanks for looking at this as a standalone work. I'm so glad you loved "Dredd" as much as the fan community seemed to! It was such a surprise that gave me a smile from beginning to end! Thank you for participating in another of our Secret Santa Review Swaps! Glad you liked this movie as much as me. It is indeed a visual feast with a great performance from Urban. I do agree the villain is underdeveloped but it's a mindless action romp. Thanks for participating in the Secret Santa!